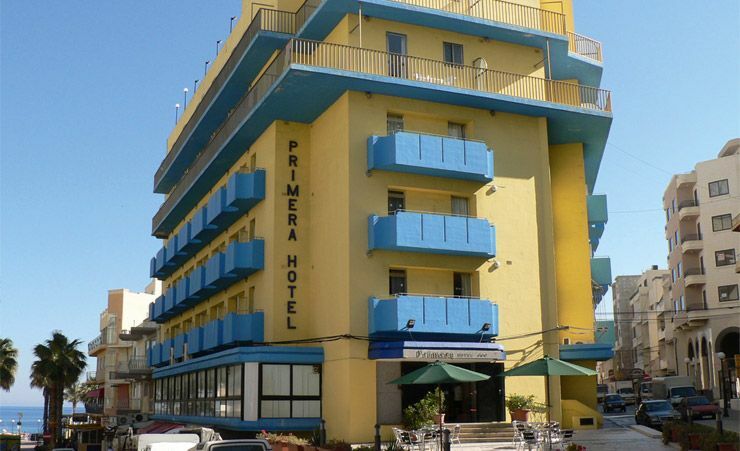 Decked out in sunny yellow and sea blue, the Primera Hotel has the look of a perfect holiday hotel. With 82 rooms spread over 8 floors, it has a more intimate feel than some of Bugibba's larger hotels and the service is very attentive. The beach is just a minute's walk from the Primera Hotel. The main Bugibba square is practically on your doorstep, and the shops, bars and restaurants are all close at hand. You're right at the heart of things here. The Primera Hotel bridges the gap between the very small and very large hotels giving travellers another option – it's perfect for couples, as well as small families. In short, it is a wonderful holiday retreat. Bugibba has so much to offer you. The distinctive pebbly beaches are perfect places to explore or to picnic on; and those large flat pebbles make a surprisingly comfortable sunbathing spot. You can also sunbathe back at the Primera Hotel. The hotel sun terraces are nicely elevated, affording some wonderful views out over the St Paul's Island and the open sea beyond. In between jaunts out, or spells on the terrace, you'll enjoy the calm of the hotel; its spacious communal rooms making it the ideal place to meet and greet and take it easy between outings. Do make sure you leave plenty of time for the buffet breakfasts and dinners in the hotel restaurant. Or, if you're rushing off to your next adventure, there is a handy snack bar too. 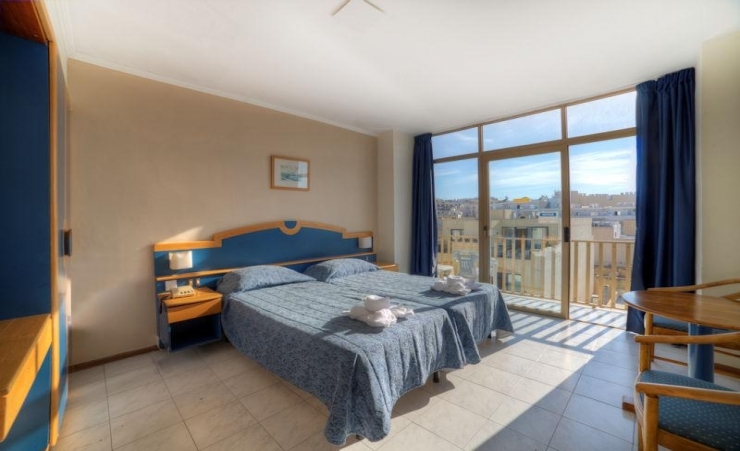 Guests at the Primera Hotel enjoy a balcony room, as standard, and, of course all are fully air conditioned to ensure a comfortable night's sleep. Rooms also benefit from satellite TV and direct dial phone. 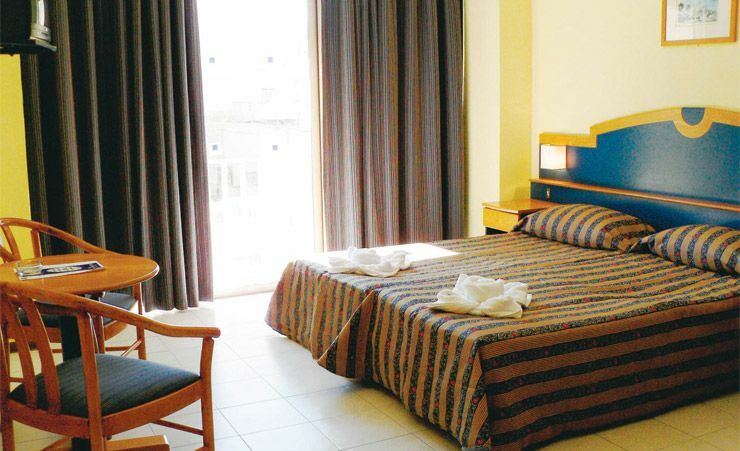 With its enviable location, within easy reach of the sea and all the amenities of Bugibba, the Primera Hotel is a popular destination for holidaymakers. Behind its sunny façade is a warm welcome and a great base for your holiday. 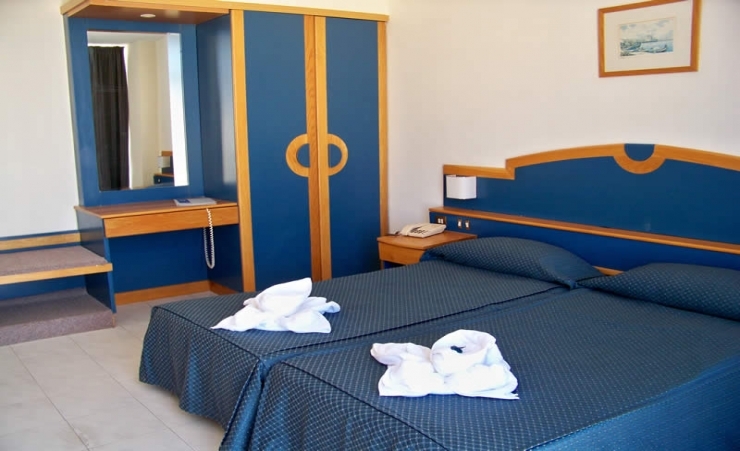 Find out more about your accommodation and the in room facilities at the Primera Hotel . A comfortable room is spacious, with a variety of facilities to ensure you have an enjoyable stay at the Primera. The decor is chic yet simple, with a blue and yellow theme running throughout. The Primera Hotel's comfortable rooms are all spacious, with a variety of facilities to ensure you have an enjoyable stay at the hotel. Many of the rooms have balconies and enjoy sea, inland or internal views, depending on the category of room chosen. The decor is chic yet simple, with a blue and yellow theme running throughout. The twin resorts of St. Paul's Bay and Bugibba have become increasingly popular in recent years, along with the quieter and more exclusive area of Qawra nearby. Situated on the eastern side of the Bay the resorts look across to St. Paul's Island. Bugibba is a thriving resort. There is excellent bathing from smooth rock platforms. A wide selection of restaurants, bars and night spots line the seafront promenade. The town of St. Paul's Bay itself is somewhat quieter than Bugibba and the old town still manages to retain an old Maltese charm. Qawra is slightly more laid back with a narrow shingle beach and a selection of shops, bars and restaurants. A good three star hotel and very conveniently located. Staff were very good and helpful.